I love this time of year – chilly mornings, bright skies and of course the beautiful colours of the leaves. We had several leaf-related activities on our Autumn Bucket List, so we’ve been pulling on our coats and wellies, and getting outdoors to see what we can scavenge, and then coming home to create…art! Even at 32 I still enjoy kicking autumn leaves, so it’s not hard to see why little ones find the whole experience thrilling. 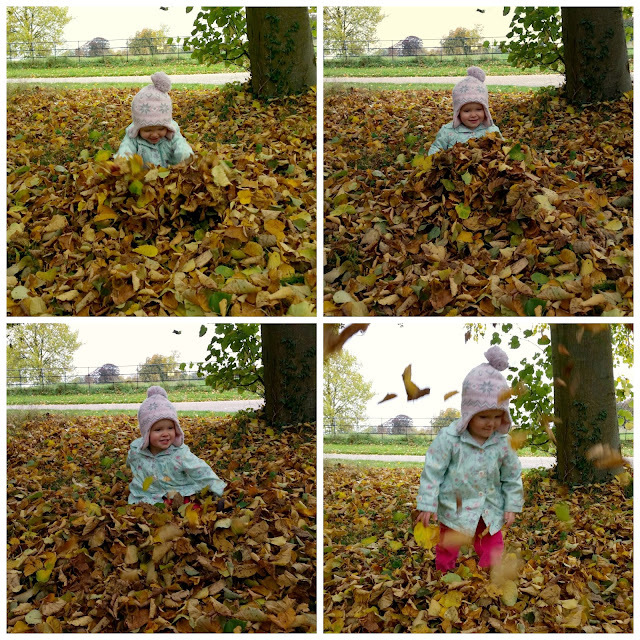 We couldn’t tear Rosalie away from beneath the trees at Basildon Park; she was welly deep in leaves! Last autumn I collected lots of bits of nature and popped them in a jar for Rosalie to safely explore, but one year on and she’s doing all the collecting herself. She had a wail of a time scavenging for pine cones, acorns, conkers, mushrooms and different shaped leaves. We had a go at doing some leaf rubbings, but Rosalie couldn’t quite get the hang of rubbing with the side of the crayon. But these leafy hedgehogs on the other hand, she did a brilliant job with! I really should have dried our collected leaves between some heavy books to flatten them, not that Rosalie minded, she was having too much fun with the glue! I'm 41 and I love kicking piles of leaves too. I don't think you ever truly grow out of it. 🙂 I love these photos of Rosalie. She's so much more a toddler now and I can't believe she's nearly two! That's good to hear! Yes, she's changed so much now she can run around, and I really can't believe she's nearly two either, the time has absolutely flown by! Oooh, a leaf crown for Halloween, now that sounds exciting!